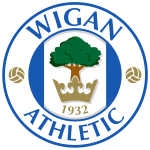 Introduction: Wigan Athletic Football Club is an English professional football club based in Wigan, Greater Manchester (who knew? ), they now compete in the Football League Championship, the second tier of English football. Founded in 1932, the club is the most recently formed club in the division. Do they still make Wagon Wheels? Home kit: microwave, two small microwave proof mixing bowls (not metal) and a wire cake rack. Divide the marshmallows roughly in half. Chop one half into small chunks, and gently heat the other half in the microwave on low power (defrost works) until melted. Leave to cool a bit and then add the chopped up ones and the chocolate drops, mix together into a goo. Use said goo to stick the rich tea biscuits together, spread the filling right to the edges. Gently melt the milk chocolate, again in the microwave using short bursts and stirring in between. Pour the melted chocolate over the biscuit sandwiches and leave to set on the wire rack with foil underneath to catch the drips.